Hello everyone and welcome to the Altenew January Release Blog Hop! If you came here from Aimee’s blog, then you are on the right track. Otherwise, go back to Altenew blog and start from there, as you won't want to miss anything! There are 18 stamp sets, 18 die sets, and 12 inks being released today and they are now available for purchase at the Altenew online store. Now, here's my card for today's blog hop. I created a simple, one layer card using beautiful stamps from Hibiscus Bouquet. I’m in love with this set, it’s perfect if you want to add that artsy feel to your projects! I chose to stamp my images in black, then I used some new and old Altenew Crisp Dye Inks: Pure Graphite, Industrial Diamond and Silver Stone for leaves. Blush, Rouge and Cotton Candy for flowers. To finish my card, I combined two sentiment stamps together for the “you inspire me”. That’s it for me, your next stop on the hop is Sveta and I can't wait to see what she came up with today! Thank you for stopping by today and enjoy the rest of the hop! Wow I really love the colors you choose! This is so romantic! This stamp set is now on my wish list! Love your card never use these colors and a card you have inspired me to try. There is something about grey and pink together that just feels right! I love your card! I love this color palette. It is so soothing. Beautiful card. Wow this is my favorite set from the new release, just love how you have used it!! Beautiful - I love the soft colors. Inspired coloring- very artsy flowers! Love the colors!! !Great job!Well done! Beautiful! I love the pink and gray and Hibiscus is a great stamp set. Yum - the new cool greys are so beautiful!! Thanks for the gorgeous inspiration. Beautiful Aga. I love a one layer card but often have trouble making them. This is lovely! Love the softness of your card. Thanks for the inspiration. Such a beautiful card! Love the soft and elegant color combination. I love this stamp set and how you used it!!! Lovely card. Would also be good for a sympathy card. Your color combo is stunning!!! Fabulous card for a fabulous new release! LOVE the color combination. That gray and pink--fabulous. Beautiful card!! 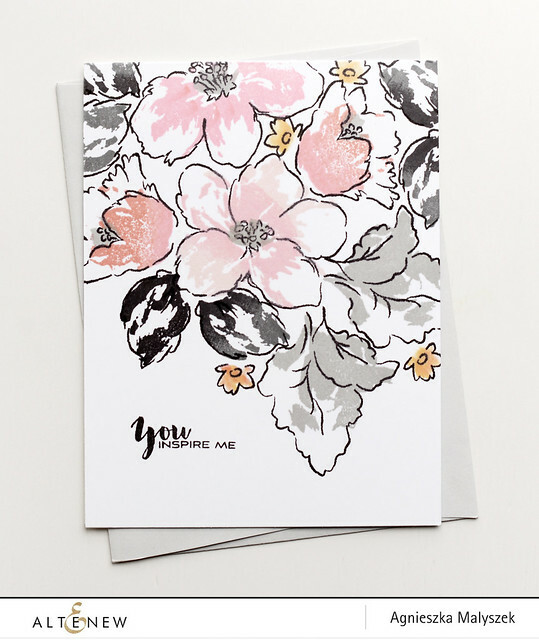 Love the design and the soft pink, gray & black colors you used! Great cards, and thanks for the chance to win!! I love simple cards but your card doesn't appear to be a simple card, it's beautiful! Love the soft color palette and the beautiful blooms. This is such a gorgeous set! Awesome! Love the pink and grey together! What a gorgeous card! Love the soft for with the gray tones. So, so pretty! Love the soft colours! Love the colors you used....gorgeous! Gorgeous! Love what you have done with these stamps and the colors....so soft and flowing! Love this subtle, elegant card. Thank you for the inspiration! beautiful card! I love the softness with your choice of colors-and the greys-yum! I love the soft colors of this card! Beautiful color combination - so pretty. Thanks. I have been following your work for many years. I love the clean design and your pops of color. Although your cards look easy to recreate, my cards never have the same pop that your cards have. I will keep trying because you are one of my favorite card makers. Great card and love the colors. Thanks for sharing. Wow! Your card is beautiful. I just love pink and grey. really wonderful use of color! Your card literally made me smile! It's so subtle and beautiful! Such a nice use of the grays and the pinks! Thanks for sharing! beautiful colors-really enjoy your talents. Oh I love your color choices, gorgeous! Your choice of pinks & greys for your card is stunning, Aga! Thank you SO MUCH for the how-to for a single layer card. I'm relatively new to card making and it's so nice to see a beautiful card that I might actually be able to make! Very pretty, I never thoughy of using pink, grey and black for flowers. Thanks for the inspiration! Simply Stunning. Nothing more to say. So, so pretty! I adore the pinks and grays together! I love your color combinations - beautiful! So gorgeous! I love the soft colors. Really love your card, beautifully done! Thanks for the inspiration! Wow your card is beautiful and I love the colors. Well, your card inspires me! It is beautiful! Grey and pink are so perfect together! I love the colors you chose for your card. Fabulous cardAga! Love the color combo and design, TFS! Beautiful--I like this color combo. What a soft colored card, beautiful colors. Wow! I would never have thought to use such colors on a floral image yet it is simply amazing! Thanks for helping me expand into new territory. This is my favorite new stamp. Love your coloring. Wow! What a pretty card. Your colours are stunning! You've just sold me on this set too! Love your card! The pink,grey & black looks stunning! Wonderful card, simple and beautiful. I really like the colors used also. I just love this pink and grey on this card. Absolutely gorgeous in soft colors. Love the soft colours you've chosen. Beautiful card! So soft and pretty. Great choice of colors. Hello Aga. I adore this. The colors are beautiful in the soft tones. Lovely floral showcase. Such a beautiful card with a great colour combo, love it. Love the colours of your card. The Hibiscus stamp set is one of my favourites. I love the artsy look of it. The Hibiscus is gorgeous and I loved the colors! Thanks for sharing! Your color choices have made this a very elegant card. So pretty. Love the soft subtle colours. Soft,clean and simple but elegant,too. Love the delicate feel of this lovely card!!! Great ink colors! TFS! How pretty. Such a sophisticated color palette! Beautiful colors - love this card! Just beautiful! I can't wait to CASE! Your card is stunning! Pink, black and grey is one of my favorite color combos! Love, LOVE, love this card! The layout, the colors, the sentiment - love it all! Lovely cards! Thanks for your work. Beautiful card. I love the colours you chose - they're great together. So lovely!! I love the use of pink and grey/silver together - such a classic and sweet color combination that is always a winner! Love the colours, layout and depth achieved in your gorgeous card! Sweet and Simple. Stamps and ink....this is Wonderful! Luv your card design and color combos. Your use of colors is perfect!!!! Love that set... love your card! And loving those pinks and grays!!! Oh Wow!!! I just got the grey ink pad set and cant wait to try this out!! Gorgeous!!!! Love your card! The hibiscus set is beautiful and I can't wait to get it. I love the delicate coloring on your card. It is lovely. Beautiful and very elegant card. Thanks for the inspiration. Beautiful. Love the subtle colors. Such elegant cards! Your subtle coloring is just enough. Thanks for sharing your creativity. Beautiful card. I love the soft colours. I love your card. So soft with the pinks and grays. Love the Hibiscus Bouquet stamp set. Must get!! Thanks for sharing! This is gorgeous! It is a great idea to use pastels with a hibiscus stamp. Elegant card with this beautiful hibiscus set! That is a gorgeous card. So elegant. These subdued colors are quite eye catching. Love the pink and grey combination of your card. Very elegant! So beautiful!! Love the colors you chose! How gorgeous! Love the pink and gray! Great soft feel to this card. I love the soft coloring on this card. Beautiful! Thanks for sharing. Your card is very professional! The colors are awesome. Thank you. OH my goodness - this card is amazing. I so love the black and grays against the pinks. Just beautiful!! Stunning card! Love your color selection. The color palette of pink blush, silver gray and black is beautiful. Love love love your color choices. Thanks for sharing. Beautiful card, looks so professional! The colors are lovely together. Beautiful card, I love your colour combination. Gorgeous! Love grey and pink together. Love your soft colours - beautiful card. Great color palette for this clean design! So pretty Aga! I love this color combination too! Beautiful! I love the soft and neutral colors you used. So cute! Love the color combos!!! Such a pretty card! Love the pinks with the grays! A sweet card anyone would love to receive. I love the colors you used on your card!! Your card is beautiful!!! Love it and this new release!!! Beautiful card! I love the grey and pink color palette with the matching grey envelope. The colors make the card soft, elegant, romantic. Thanks for sharing. The pink and grey color combo on you card is lovely! So elegant! You always make me gasp! What an incredible design Aga! Beautiful card, love the colors, such an elegant and understated look. I LOVE this Hibiscus set too! Your card is lovely! I like the muted tones you chose to stamp it in. Thanks for sharing! I love this soft, pretty card. I think the new colors are fantastic! This card is so beautiful! I love the colors you chose and the design! It's gorgeous! What a great card with soft colors! I also just love the new stamp set you used. LOVE your ELEGANT & DELICATE colours, such a DELIGHTFUL design! You picked my favorite set to demo! I love the colors and your design! Beautiful card! I love the Hibiscus set, love the colors you chose! The pink and grey is so soft and romantic! Beautiful card! I love your stuff! I'm a sucker for florals. Thanks for showing me some new stamping products and companies. I can't wait to check them out! Beautiful card, I love the pink and grey together and your design is gorgeous! I am blown away at how wonderful this entire release is. So hard to pick which I have to have since I want them all! Such a pretty, soft feel to this card - I love grey and pink together! Thanks for sharing! I like the simplicity of your card. Very gorgeous CAS card with this new release stamp set ! Wonderful colour combo ! Thanks for sharing. Gorgeous card! The stamping is amazing! The colors are so elegant. Beautiful card! Great card, lovely use of colour. Gosh, what a beautiful card! I love your pink and grey colour scheme, and your soft, artsy design: really lovely. Love the use of the grey tones on your card. Stunning card, love your graphic style. Beautiful stamps too. Beautiful design, love the colours on this pale design, so pretty.